OUR long term test Hyundai ix35 has run the gauntlet in recent weeks, being tested by baggage, mechanic and small messy child. Its most important task was to accept my 16-month-old's car seat. As most parents know, modern child seats are mighty things and can prove outrageously tough to fit in the back of smaller vehicles, especially coupes. No problem for the ix35 SUV however. The seat tethered in simply behind the rear seats, and there's plenty of space above and around the child seat to give the little chap a nice sense of roominess. The better half is already smitten at how much easier it is loading the boy in and out of the car seat in the ix35; being that bit higher off the ground than our Volvo V50 wagon. No wonder young mums are snapping up SUVs as their preferred family transport. The downside of having an infant in a new car is his lack of respect for the spotless interior. Books, toys and the odd bit of food are now regularly dispersed across the rear pew and the back of the passenger seat, but thankfully the half-leather seats are easier to clean than the Volvo's fabric. 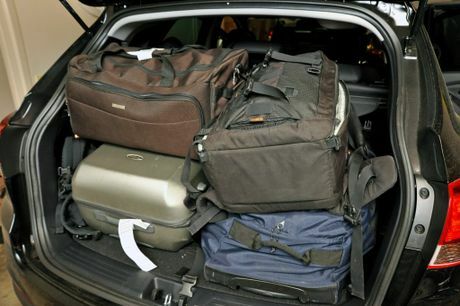 A family holiday last week also meant the ix35 had to prove its baggage carrying ability. With only three of us travelling (and one of those being the infant), the boot did fill up surprisingly quickly. The split-rear seat ultimately had to go down to fit the buggy in, and it got me thinking would this car be large enough if there were four of us off on a holiday? The ix35 is quoted as a small SUV, so one can't expect a gargantuan boot, but it was interesting to see that the cargo space in these SUVs sometimes isn't as big as we assume. 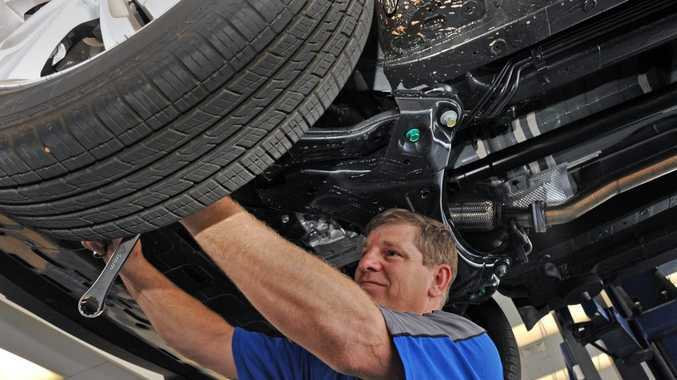 The Hyundai also received its 1500km service - the complimentary check over most dealers offer new customers. Dave Harvey, senior mechanic at Sunco Hyundai, explained that it's basically a visual inspection around and under the car. With the ix35 on a hoist, Dave went over the exposed bolts on the underside and the wheel nuts to check all were tight and correct. Back on the ground he checked all the fluid levels, tyre pressures, lights, seatbelts, seats and interior. Finally, he plugged in the electronic diagnostic system. This revealed that the steering angle sensor had not been calibrated - part of the car's electronic stability program - so carried out a recalibration here to fix. The joys of these electronic diagnostics meant the problem was swiftly recognised and rectified - illustrating the importance of having the 1500km check over. The day after the ix35 was at the dealership, I have to report our first problem. For some reason the key fob that locks and unlocks the door has stopped working. A result of the recalibration? Back to Hyundai to find out.